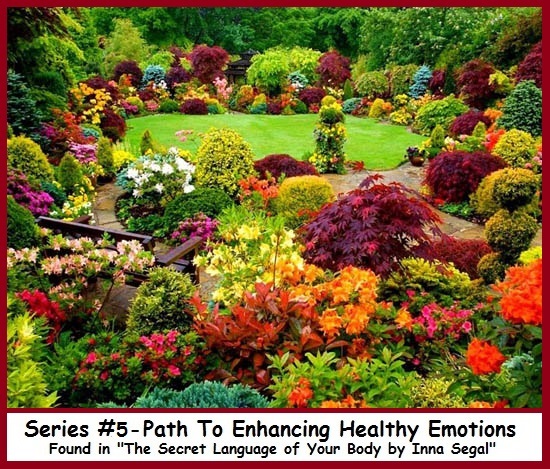 We continue author Inna Segal’s exercises enhancing healthy emotions by first looking at her next Ten Basic Principles for Healing. Principle 7: Be Creative. Creativity allows you to relax, have fun, and explore. When people are creative, they are often more inspired, imaginative, and resourceful. Principle 8: Add More Color To Your Life. Colors can make people feel heavy, depressed, and fatigued or light, vibrant, and joyful. Become aware of the colors that make you feel great and the qualities they have, and then add these colors to your life. Now begin the exercises by finding a quiet comfortable location and body position. Breathe deeply for several moments. Keep a notepad and pen nearby to write down insights that may come to you in the process. 3. People experience joy when their hearts are open to give and receive love. No matter who you are, you have the ability to contribute to others – to touch and warm their hearts. If you would like to experience more joy, focus on what you can do or say to inspire someone else, and then become aware of your heart opening. When people are joyful, they are connected to the Divine Source of love. Each day, communicate with that spiritual part of you. Listen to this Divine aspect of yourself, and allow it to guide you. 3. How would it feel to let go of all anger and negativity to discover peace and freedom? Be willing to let go of anger, and focus on peace instead. Find time for stillness and quiet where you can allow inspiration to flow to you. SERIES #6 COMING UP NEXT.